The gloss is shiny like patent leather. Excellent for costumes. backdrops, tablecloth as well as bags and accessories. Available in white, purple, silver, red and black. The matt provides a subtle look and interesting texture. 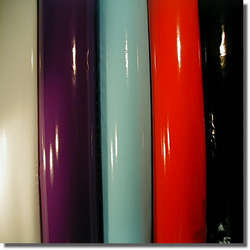 There is a larger range of colours for the lightweight vinyls - Black, white, red, purple, royal blue, yellow, hot pink, lime and orange. -PVC will not run if overstretched. - Drip dry in shade. Vinyl - extruded polyvinyl chloride synthetic fabric flowed onto a knitted, woven, or non-woven base cloth imitating leather.